Microtubule proteins and their post-translational forms in the cerebrospinal fluid of patients with paraparesis associated with HTLV-I infection and in SH-SY5Y cells: An in vitro model of HTLV-I-induced disease. HORACIO MALDONADO1, EMILIO ORTIZ-RIAÑO1, BERNARDO KRAUSE1, ANDRÉS BARRIGA1, FERNANDO MEDINA1, M ELSA PANDO1, CAROLINA ALBERTI1, ANA M KETTLUN1, LUCÍA COLLADOS1, LORENA GARCÍA1, LUIS CARTIER2, and M ANTONIETA VALENZUELA1. 1 Departamento de Bioquímica y Biología Molecular, Facultad de Ciencias Química y Farmacéuticas, Universidad de Chile, Santiago, Chile. 2 Departamento de Ciencias Neurológicas, Facultad de Medicina, Universidad de Chile, Santiago, Chile. HTLV-I-associated myelopathy/tropical spastic paraparesis (HAM/TSP) is characterized by axonal degeneration of the corticospinal tracts. The specific requirements for transport of proteins and organelles to the distal part of the long axon are crucial in the corticospinal tracts. Microtubule dysfunction could be involved in this disease, configuring an axonal transport disease. We measured tubulin and its post-translational modified forms (acetylated and tyrosinated) in CSF of patients and controls, as well as tau and its phosphorylated forms. There were no significant differences in the contents of tubulin and acetyl-tubulin between patients and controls; tyrosyl-tubulin was not detected. In HAM/TSP, tau levéis were significantly reduced, while the ratio of pT181/total tau was higher in patients than in controls, this being completely different from what is reported in other neurodegenerative diseases. Phosphorylation at T181 was also confirmed by Mass Spectrometry analysis. Western Blotting with monospecific polyclonal antibodies against pS199, pT205, pT231, pS262, pS356, pS396, pS404 and pS422 did not show differences in phosphorylation in these residues between patients and controls. Treating human SH-SY5Y neuroblastoma cells, a well-known in vitro neurite retraction model, with culture supernatant of MT-2 cells (HTLV-I infected cell line that secretes the viral Tax protein) we observed neurite retraction and an increase in tau phosphorylation at T181. A disruption of normal phosphorylation of tau protein in T181 could result in its dysfunction, contributing to axonal damage. HTLV-I-associated myelopathy/tropical spastic paraparesis (HAM/TSP) is characterized by the bilateral loss of axons in the corticospinal tracts (Cartier et al., 1997). This central axonopathy could originate from axoplamic transport impairment as suggested from immunohistological observations of amyloid precursor protein (APP) accumulation, usually associated with alteration in anterograde axonal transport (Umehara et al., 2000; Cartier et al., 2007). HAM/TSP shows clinical and histopathological similarities with hereditary spastic paraplegia, where axonal degeneration seems to arise from impairment of axonal transport (Ferreirinha et al., 2004; De Luca et al., 2004). CD4+ cells are the main reservoir of HTLV-I; both CD8+ cells and astrocytes may also be infected, but not neurons (Grant et al., 2002). Since axonal degeneration occurs without infection of neurons, HTLV-I should exert its effects through extracellular action of the secreted viral protein Tax, chronically present in CSF of HAM/TSP patients (Szymocha et al., 2000; Osame, 2002; Cartier & Ramírez, 2005; Jain et al., 2007). Neither inflammatory ñor immune hypotheses explain the pathogeny of HAM/TSP in 40% of clinically identical patients who are seronegative, but have the tax gene (Ramírez et al., 2003). Studies in vitro have shown Tax binding to many cellular proteins, which regúlate transcription and cytoskeleton-related pathways (Wu et al., 2004). The phosphatase PP2, involved in the balance of phosphorylation of cytoskeletal proteins, is inhibited by formation of a ternary complex Tax-Ikky-PP2A(Fuetal.,2003). α- and (β-tubulins, the primary components of microtubules, undergo several post- translational modifications, including acetylation and detyrosination (Kreitzer et al., 1999; Nogales, 2000). While acetyl-tubulin is associated with stable structures, tyrosyl-tubulin is characteristic of dynamic structures. Another protein involved in microtubular dynamics and transport is tau, functionally modulated by phosphorylation (Buée et al., 2000; Avila et al., 2004). Tau is involved in microtubule dynamics promoting tubulin polymerization, stabilization of microtubules, controlling attachment/ detachment of motor proteins, and participation in signal transduction and organelle transport (Trinczek et al., 1999; Buée et al., 2000; Avila et al., 2004, Mondragón-Rodríguez et al., 2008). Tau functions are modulated by site-specific phosphorylations, these being deregulations of kinases and phosphatases associated with abnormal hyperphosphorylation of tau in several neurodegenerative diseases (Avila et al., 2004; Johnson & Stoothoff, 2004; Iqbal et al., 2005; Sergeant et al., 2005; Wang et al., 2007). Both normal and structurally altered cytosolic proteins are released from the CNS into CSF, so that CSF proteins reflect changes in the CNS (Alonso et al., 2006; Maccioni et al., 2006; Blennowetal.,2007). In the present study we have measured the relative amounts of microtubule proteins, including their post-translationally modified forms in CSF of HAM/TSP and compared to those of control subjects. While no differences in tubulin and acetyl-tubulin were found between these two groups of study, in HAM/TSP tau levéis were significantly reduced with higher phosphorylation at threonine-181 (pT181), thus the ratio of pT181/total tau was higher than that in controls and other neurodegenerative disorders. Neurite retraction in response to extracellular signáis occurs in neurodegeneration, therefore the use of neuronal cell culture as an in vitro model of neurite retraction could be a useful tool for understanding molecular mechanisms of neurodegeneration (Sayas et al., 2002). In HAM/TSP, the injury has been attributed to viral proteins secreted from infected CD4+ cells present in the CNS (Osame, 2002; Grant et al., 2002; Cartier & Ramírez, 2005). 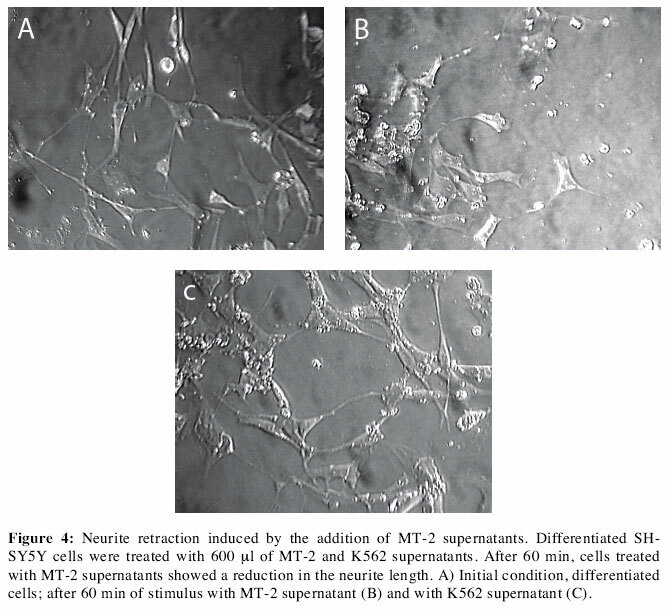 The treatment of human SH-SY5Y neuroblastoma cells (Sayas et al., 2002; Jámsá et al., 2004) with culture supernatant of MT-2 cells, a HTLV-I infected cell line that secretes the viral Tax protein (Alephantis et al., 2005), produces neurite retraction and an increase in tau phosphorylation at T181. CSF was obtained from 14 patients with HAM/TSP (aged 45-68), with a disease-duration of 2-8 years. These were identified both clinically and by determination of specific antibodies reacting with viral antigens in serum (Galeno et al., 1994). The control group (all seronegative) was composed of 16 subjects (aged 48-69), including people without neurological disorders from gynecology (spinal anesthesia) and with non-inflammatory or non-degenerative neurological diseases that required lumbar puncture (cephalgia, neuropathy). Controls and patient groups were duly informed of the research protocol approved by the Clinical Research Ethics Committee of the Hospital del Salvador, Santiago, Chile. CSF samples were obtained by lumbar puncture as part of the normal procedures and were frozen at -20°C. CSF from HAM/TSP had a cell count of 0-12 per μl and an average concentration of human serum albumin (HSA) of 0.16 ± 0.09 mg/ml; CSF from the control group had a cell count of 0-5 cells per μl, and average of HSA of 0.21 ± 0.07. In the HAM/TSP group there were no correlations between cell counts, years of disease and functional level (bedridden, wheelchair, gait with support, gait with and without support). Human SH-SY5Y neuroblastoma was maintained in a mixture of Dulbecco's modified Eagle's nutrient médium and F12 -Ham in a 1:1 proportion (Sigma-Aldrich, St Louis, MO USA) supplemented with 6% heat-inactivated fetal calf serum (FBS) (Hyclone, Thermo Fischer Scientific Inc, South Logan, UT, USA). Cells were seeded at an initial density of 2.2 x 103 cells/cm2. The differentiation protocol was based on the report of Jámsá et al. (2004), with some modifications. Briefly, after 24 hours of seeding the differentiation, a neuronal-type was induced by the addition of 10 [iM all-frans-retinoic acid (Sigma), with gradual daily reductions of the FBS concentration (from 6 to 0%) over 5 days. Then 50 ng/ml BDNF (Alomone Laboratories, Jerusalem, Israel) was added for 2 days. BDNF was removed and the culture médium of SH-SY5Y cells was replaced by a DMEM-F12 Ham mixture without serum, four hours prior to the addition of the supernatants of MT-2 and K562 cultures. MT-2 and K562 cells (5 to 10 million in 10 mi) were cultivated in RPMI, as reported by Ramírez et al. (2004) except for reduction in FBS from 10 to 0.2% for 7 to 14 days. Cell extracts were prepared as follows: cells were washed with phosphate buffered saline and then re-suspended in a RIPA buffer (25 mM Tris-HCl pH 7.6, 150 mM NaCl, 1% Nonidet P40, 1% sodium deoxycholate, 0.1% SDS), protease inhibitor cocktail 2 μl/mL (Cat P8340, Sigma-Aldrich) and 1 mM sodium-o-vanadate following mechanical disruption. The soluble fraction was obtained by centrifugation at 14,000 x g for 15 min at 4°C. Protein determination was done using the BCA Protein Assay kit from Pierce (Pierce, IL, USA), according to the manufacturer's instructions. Cultures were examined under a phase microscope and captured directly as digital micrographs in black and white. Images were acquired using a 20x objective lens and photographs taken from 7 different fields, with Z configuration, were analyzed. Neurite length was measured using the NIH ImageJ-1.38d plug-in program neuronJ. Neurite length corresponds to the net extensión away from the cell body, i.e. from the margin of the cell body to its terminus. The measurement was made using the program's handheld cursor. Data collected from 200-300 neurites were used for each condition, and the program gives the population's average neurite length in pixel counts on digitized images. All neurites measured were included in the statistical tests. Human albumin analysis by capillary zone electrophoresis was performed on an Ion Analyzer Capillary Electrophoresis System (Waters, Mildford, MA, USA) with Millennium software (Waters) for data handling. The separation was performed at 18 kV using an uncoated fused-silica capillary of 60 cm x 50 [im, with 150 mM phosphoric acid as an electrolyte, at 25°. The sample was introduced by hydrodynamic injection (10 cm height) for 30 s, the detection was made at 185 nm. The human serum albumin (HSA) peak was assigned by adding a standard solution of HSA. Adequate antibody dilutions were tested by dot blot. SDS/PAGE was performed with 10% polyacrylamide gels (for tubulin studies) or 12% (for tau analysis). Portions of 10 μl of CSF and 20 μg protein of cell lysate were used. The buffer for electrotransfer to nitrocellulose membranes (BioRad, Hércules, CA, USA) contained 25 mM Tris-HCl, 192 mM glycine and 20 % (v/v) methanol, and electrotransfer was done at a total of 600 mA at 4°C. After electrotransfer, membranes were blocked for 1 h at room temperature with 6% Quick-Blocker dissolved in TBS-T (20 mM Tris-HCl, 137 mM NaCl, 0.1%(v/v) Tween-20, pH 7.6), then incubated overnight at 4°C with the different primary antibodies at the appropriate dilution in TBS-T buffer. The following monoclonal antibodies were used: against acetyl-tubulin (dilution 1:50; Cat T6793, Sigma-Aldrich, Inc, St Louis, MO, USA); against tyrosyl-tubulin (dilution 1:50; Cat T9028, Sigma-Aldrich); and against HSA (dilution 1:2000; Cat. MON5024, Monosan, Brussels, Belgium). The following polyclonal antibodies were used: against tubulin (1:200; Cat. T3526, Sigma-Aldrich); against total tau (dilution 1:1,000, Cat AH0042, TAU-5, BioSource-Invitrogen Corporation, Carlsbad, CA, USA). The following polyclonal antibodies were used: against tubulin (1:200; Cat. T3526, Sigma-Aldrich); against tau (dilution 1:1,000; Cat T1032, US Biological, Swampscott, MA, USA); against tau-phospho T181 (1:1,000; Cat. ab38505, Abcam, Cambridge, UK), and against nine different phosphorylated residues of tau (dilution 1:5000, BioSource-Invitrogen Corporation). After washing three times (10 min each wash) with TBS-T (without milk), membranes were incubated with the corresponding secondary antibody. As a secondary antibody we used: anti-rabbit conjugated with peroxidase diluted 1: 20,000 (Cat. 1858415, Pierce, IL, USA) or anti-mouse conjugated with peroxidase diluted 1:10,000 (Cat. 1858413, Pierce). Blots were incubated for 1 h with peroxidase-conjugated secondary antibodies. After rinsing three times (10 min each rinse) with TBS-T (without milk), positive reactions were identified using enhanced chemiluminiscence SuperSignal West Pico Chemiluminiscent substrate (Pierce) in the case of analysis of tubulin and their modified forms, and using SuperSignal West Femto Chemiluminiscent substrate (Pierce) in all the other analyses. X-ray films (CL-Xposure film, Pierce) were exposed for varying times. Control experiments (without primary antibodies) with only secondary antibodies did not give any chemiluminescent signal. For consecutive analyses with various antibodies, stripping was performed using the ReBlot plus mild antibody solution (Chemicon) according to the manufacturer's instructions. Blots were then blocked and probing was performed as above. Analysis of tubulin and acetyl-tubulin in CSF by Western Blotting showed the presence of a single protein band with the corresponding molecular weight (cióse to 100 kDa); there was no signal with anti-tyrosyl-tubulin. The relative amounts of tubulin and acetyl-tubulin were determined by dot blot, by applying portions (10 [il for acetyl-tubulin, 5 \i\ for tubulin) to the nitrocellulose membrane. CSF samples from HAM/TSP and controls were tested on the same membrane. Dilutions of primary and secondary antibodies were the same as used for the Western Blotting. Total tau and tau phosphorylated at T181 were determined using ELISA kits (Cats. KHB-0042 and KHO-0631, Biosource International), both designed for CSF analysis. The kit for total tau uses as standard recombinant human tau-441 expressed in E. coli, and the kit for human tau [T181] used the same recombinant human tau-441 phosphorylated in vitro with GSK-3β. Western Blot or dot blot signáis from CSF samples were scanned and quantified using the "Un-scan-it gel" Graph Gel Digitizing software (Silk Scientific Corporation, Orem, UT, USA). Valúes of integrated density are reported in Arbitrary Units (pixels). Albumin was removed from CSF samples using the Montage Albumin Deplete Kit (Millipore, Billerica, MA, USA). Albumin removal from a sample was optimized processing through the affinity column at least eight times, instead of the two times recommended by the manufacturer. Albumin removal was followed by both capillary electrophoresis and western blot using monoclonal antibodies. To enrich for phosphopeptides, a commercially available phosphopeptide isolation kit (SwellGel® Gallium-Chelated Disc from Pierce) was used, following the manufacturer instructions. A portion of 2 mi of CSF of a patient was concentrated by centrifugation with Centricon® column YM-30 (Millipore corporation, Billerica, MA, USA), then the albumin was removed as described above with further concentration by speed vac. The pellet was resuspended in 100 \ú of 50 mM NH4HCO3. The solubilized proteins were reduced by adding 25 \ú of 45 mM DTT (45 °C, 15 minutes) and then alkylated with 25 [i\ of 100 mM iodoacetamide at room temperature for 20 minutes. Trypsin digestión was carried out adding 2 [ig of porcine trypsin (Promega, Madison, WI, USA) at 37 °C for 24 hours. Reaction was concluded by freezing the sample at -20 °C and it was kept frozen until the analysis. Tryptic peptides were concentrated to dryness using speed vac centrifuge and dissolved in 0.1% v/v formic acid. An aliquot of each sample was desalted using Zip Tip C18 (Millipore, Billerica, MA, USA). A stock solution of α-cyano-4-hydroxycinnamic acid (CHCA) matrix was prepared by dissolving 10 mg/ml solution in 50% v/v acetonitrile and 0.05% v/v formic acid, and a stock solution of 2,4-dihydroxybenzoic acid (DHB) matrix by dissolving 20 mg/ml solution in 50% v/v acetonitrile and 1% v/v phosphoric acid. Portions of 1 μl of a mixture 1:1 or 1:10 of the sample and matrix solution were spotted on a micro scout target. Additionally 1 μl of 25 mM ammonium citrate was added to CHCA preparations. Mass spectra were acquired in a Microflex MALDI-TOF instrument (Bruker Daltonics, Inc. MA-USA) in positive and reflection mode. Before mass spectra acquisition, the instrument was externally calibrated using a peptide mix of a 1,000-3,000 mass range. Final spectra corresponded to 15 scans of 30 láser shots rastered uniformly across the sample spot. Mass spectra data were examined for identification of putative phosphorylation sites using the PeptideMap tool (PROWL The Rockefeller University, http://prowl.rockefeller.edu). All the searches were performed considering cysteine modified with iodoacetamide as fixed-modification, oxidized methionine and phosphorylation on serine and threonine as partial modifications, three incomplete proteolytic cleavages, a peptide mass tolerance between 0.1-0.3 Da and the human tau sequence (gi:6754638). All statistical analyses in these studies were performed with the Statistical Package of the Social Sciences (SPSS). Differences between means of HAM/TSP patients and controls were evaluated using the Student's t-test for two independent-samples. When data did not conform to a normal distribution according to the Shapiro-Wilks test, they were normalized using the log10 transformation. The statistical analysis of neurite outgrowth between both studied groups at the same evaluation time was carried out using the Student's t-test for two independent-samples. Statistical significance was assumed at p < 0.05. Comparison of the levéis of tubulin and acetyl-tubulin (relative to albumin concentrations) in CSF samples from HAM/ TSP and controls did not show significant differences. Tyrosyl-tubulin was not detected. CSF concentrations of total tau and phosphorylated tau at T181 in patients and control subjects were determined by ELISA. There was a significant decrease in the concentration of total tau and a high concentration of the pT181 epitope in CSF samples from HAM/TSP with significantly higher pT181/total tau ratio compared to controls (Table I). No correlation between CSF tau phosphorylation at T181 with the years of the disease was found. A main band of 52 kDa and a much less intense band of 63 kDa were detected when the membrane was developed with anti-tau (Figure 1, lane B). The various mono-specific polyclonal antibodies against diverse phosphorylation sites mainly showed the 52 kDa band. As a representative case, reactivity to the antibody against T205 is shown in Figure 1 (lane C). Immunoreactive bands against both unphosphorylated and phosphorylated forms of tau with Mw between 52-55 kDa have already reported (Sjogren et al., 2001, Borroniet al., 2007). Abnormal hyperphosphorylation of various residues including S199, T205, T231, S262, S356, S396, S404 and S422, was evaluated by Western blotting, using a battery of mono-specific polyclonal antibodies with CSF samples of both patients and controls on the same nitrocellulose membrane. Densitometric analyses of the phosphorylated residue bands and the same band revealed that antibodies that recognized total tau were expressed as Arbitrary Units (pixels). The results expressed as the ratio of P-residue/52 kDa tau isoform are shown in Table II. Data expressed as the ratio of P-residue/52 kDa tau isoform or P-residue/mg HSA (data not shown) were not different in patients compared to those of controls. The presence in CSF of phosphorylation of tau in T181 was also confirmed employing the MALDI-TOF technique. To improve the sensibility of the analysis, we previously removed the large excess of human albumin that is also phosphorylated. 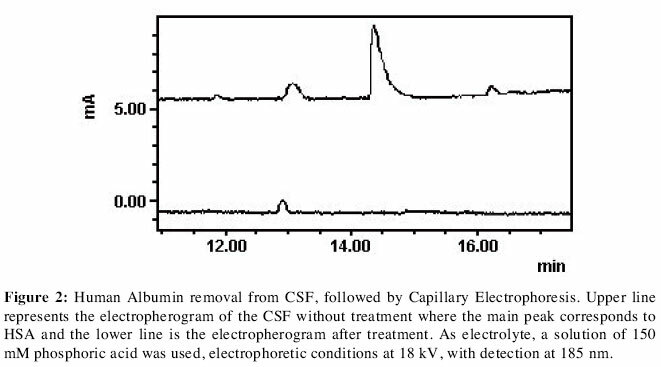 Fig 2 shows the electropherogram of a CSF sample before and after the removal of albumin. Significant albumin removal was also observed by western blot analysis (data not shown). 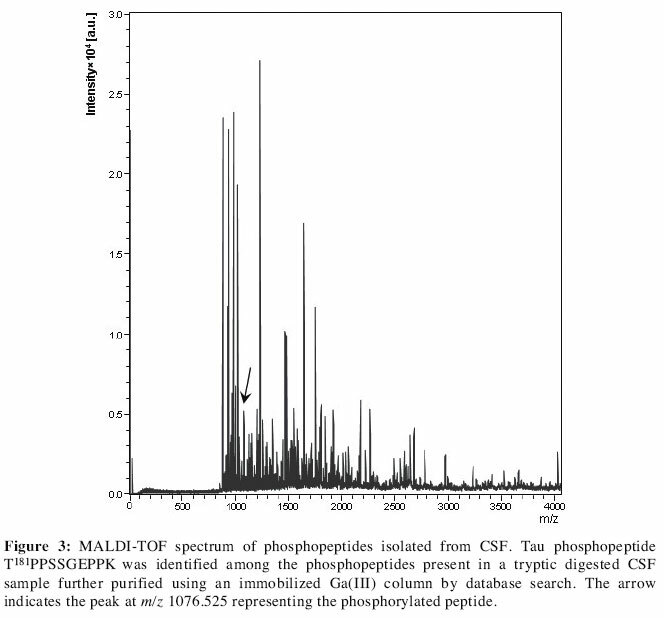 MALDI-TOF mass spectra of the phosphorylated peptides isolated from the gallium (III) affinity chromatography is shown in Fig 3. The peptide analysis indicated the presence of a phosphorylated peptide with the miz of 1076.525, corresponding to the sequence T181PPSSGEPPK, and confirming the presence of phosphorylation in T181. Phosphorylation of the two serine residues is not reported. The low proportion of tau in CSF prevented us from analysing all the CSF samples because a large volume of CSF is required. With the purpose of initiating further studies in a cell line model, a culture of differentiated human SH-SY5Y neuroblastoma cells was treated for 60 min with culture supernatant of MT-2 cells (HTLV-I infected) (Fig 4). 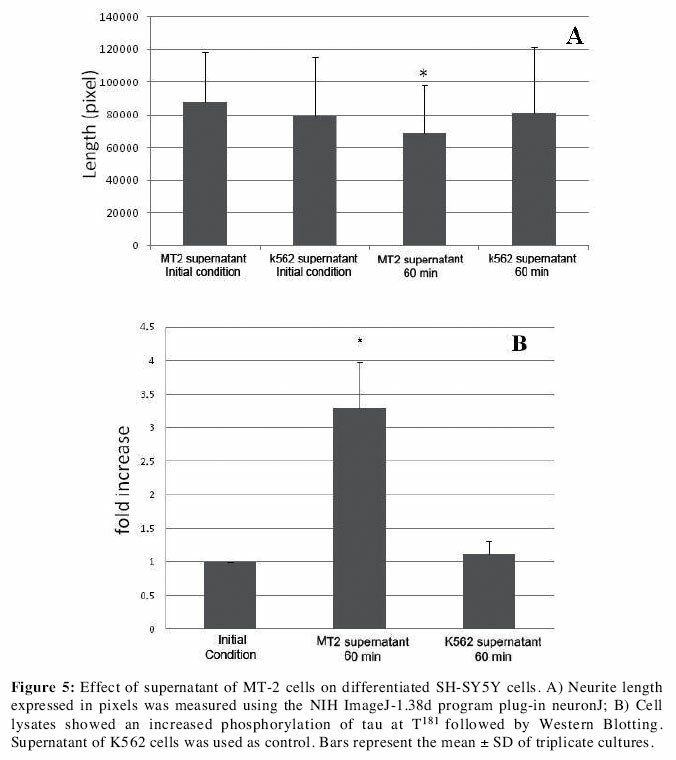 The treatment produced a significant reduction in the neurite length while the control experiment of SH-SY5Y cells incubated with supernatant of K562 cells maintained the initial neurite length (Fig 4 and 5A). Western blot analysis of cell lysates, shown in Fig 5B, indicated a hyperphosphorylation of tau at T181 in neuroblatoma cells treated with the supernatant of MT-2 cells that contains secreted viral proteins (Alefantis et al., 2005). The major immunoreactive band against pT181 and total tau (data not shown) showed the similar Mw of 52 kDa, as that observed in CSF (Fig. 1). No changes in total tau protein were observed. According to the literature in differentiated cell culture, a band with Mw of 48 is immunoreactive, with the same specific antibodies against different phosphoforms of tau as used in our study (Jámsá et al., 2004). In CSF of HAM/TSP neither tubulin ñor acetyl-tubulin showed significant changes compared to the control group. Tyr-tubulin was not detected in CSF. Our results contrast with those reported in MS, another chronic neurological disease with axonal degeneration (axonopathy), loss of myelin and APP axonal accumulation, where tubulin concentration in CSF correlated with disease progression, increasing in patients with progressive MS (Semra et al., 2002, Teunissen et al., 2005). We have not found any reports on measurements of these post-translational modifications of tubulin in CSF. It has been suggested that increased intrathecal reléase of tau reflects the degree of neuronal degeneration and damage (Bartosik-Psujek & Stelmasiak, 2006; Otto et al., 2008). Total tau has been found to be increased in Alzheimer' disease (AD), semantic dementia (SD), múltiple sclerosis (MS), amyotropic lateral sclerosis (ALS), Creutzfeldt-Jakob disease (CJD), and Guillain-Barré syndrome (Brettschneider et al., 2006a,b; Bartosik-Psujek & Stelmasiak, 2006; Buerguer et al., 2006; Terzi et al., 2007). On frontotemporal dementia (FTD) however, there are controversial results, no changes or increased levéis have been reported (Olsson et al., 2005). The highest levéis of tau in CSF positively correlate with the rate of degeneration, their being higher in CJD, modérate in AD and normal in patients with diseases with limited degeneration (Hesse et al., 2001). In CSF from HAM/TSP, a chronic disease, we found that total tau was significantly diminished compared to that of controls. The significant increases in both pT181 level and tau-pT181/total tau ratio in CSF from HAM/TSP patients suggest the presence of a hyperphosphorylated isoform of tau. Hyperphosphorylation of T181 has been detected in the CSF of patients with AD, with CJD both in vCJD and sCJD, with relapsing-remitting-MS, with SD, and with cerebrovascular disease (Olsson et al., 2005; Goodall et al., 2006; Burguer et al., 2006; Skinningsrud et al., 2008; Otto et al., 2008). The increase in the level of pT181 is not a marker of simple neuronal loss (Hesse et al., 2001; Otto et al., 2008). Interestingly, in HAM/TSP, a large proportion of total tau is phosphorylated at T181, compared to all of these other pathologies, deduced from the higher valúes of the ratio pT181/total tau. Compared to MS, CSF levéis of total tau in HAM/TSP were not elevated, while a greater increase in pT181 was observed (Bartosik-Psujek and Stelmasiak, 2006). Nevertheless, the ratio pT181/total tau was always higher in CSF from HAM/TSP than that of the other groups. It is not possible to conclude that a unique hyperphosphorylation at T181 could be exclusive to HAM/TSP, because among the various neurological diseases where this increase is also observed, only studies in CJD and AD have been done in CSF using specific antibodies against other phosphoresidues. These findings showed phosphorylation increases in residues T181, S199, S202 and S404 in CJD, and in T181, S199, T231, S235 in AD (Van Everbroeck et al., 2002; Otto et al., 2008). Probably this residue could be more exposed to kinase actions due to its location in the aminoterminal projection domain (Shahani & Brandt, 2002). Abnormal phosphorylated tau has been related to axonal microtubule dysfunction causing neuron degeneration that could severely affect fast axonal transport and causing neuron degeneration (Shahani & Brandt, 2002; Avila et al., 2004). Threonine 181 is not localized in the characteristic microtubule interaction site, but is within the projection domain. The precise dysfunctional implications of this phosphorylation are not clear (Shahani & Brandt, 2002). Some in vitro studies indicate that the projection domain is involved in microtubule binding by reducing the dissociation constant and increasing the rate of interaction with tubulin, with no change in the stoichiometry (Gustke et al., 1994; Shahani & Brandt, 2002). As well, this domain can interact with other cytoskeleton elements and fyn protein and PLCγ, and is required for microtubule nucleation (Buée et al., 2000; Shahani & Brandt, 2002). The increase in tau-pT181 could be due to an over-expression or activation of kinases, such as GSK-3β and Cdk5, that can act alone or be co-stimulated by PKA and CAMKII (Sengupta et al., 2006a,b; Li et al., 2006; Wang et al., 2007). A functional association of Cdk5-GSK-3β-PP2A has been suggested, with a key mediator role of GSK-3β in tau hyperphosphorylation, where Cdk5 is a modulator of the phosphorylation acting via the inhibitory regulation of GSK-3 (Plattner et al., 2006). The regulation of tau phosphorylation by protein kinases also includes other residues, such as S199, T205, T231, S262, S356, S404 and S422. 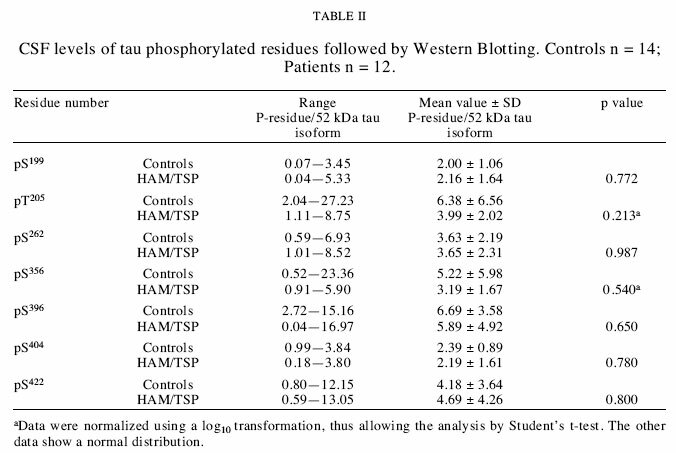 However, in CSF of HAM/TSP, the tau isoform of 52 kDa was similarly phosphorylated, as in controls in these residues (Table II) (Van Everbroeck et al., 2002; Hampel et al., 2005; Buerger et al., 2006; Sengupta et al., 2006a4b). A dysregulation of kinases/phosphatases could also affect the functioning of motor proteins and MAPs associated with transport and growth cone, respectively, because normal cellular function relies on the phosphorylation state. The neurite retraction and increase in tau phosphorylation in the human cell culture model treated with a supernatant of MT-2 that secretes Tax (Alefantis et al., 2005) agree with data observed in HAM/TSP patients that included axon degeneration and increase in tau phosphorylation at T181 deduced from cytological and CSF analyses, respectively. We chose the human neuroblastoma SH-SY5Y cell line because it is phenotipically similar to CNS puré neurons, producing long axon-like extensions (Sayas et al., 2002). We found a similar expression pattern of tau as that found in CSF. A single publication reports the extracellular effect of Tax protein on a differentiated neuronal cell line NT2-N, inducing TNF-α production. No studies on alteration of neurites have bee done (Cowan et al., 1997). Changes in the neuronal cytoskeleton occur during neurite retraction in response to extracellular signáis, including rearrangements of microtubules, actin filaments and neurofilaments. In all cases, the activation of several kinases is involved (Sayas et al., 2002). There is work in progress to provide an association between the higher tau phosphorylation at T181 and kinase/phosphatase activities in the neuronal culture when it is submitted to the action of the secreted proteins from chronically HTLV-I infected MT-2 cells. The abnormal hyperphosphorylation of tau might produce conformational changes that could make this protein either a better substrate for kinases or a worse substrate for phosphatases (Iqbal et al., 2005) and cause dettachment of tau from microtubules, leading to microtubule breakdown, disruption of axonal transport and axonal degeneration (Bartosik-Psujek & Stelmasiak, 2006). Although we found hyperphosphorylation in T181 and phosphorylation in neurofibrillar tangles, these structures have not been detected in anatomo-pathological analysis (Cartier et al., 2007). The findings of neurite retraction in the in vitro cell culture by the action of secreted producís from MT-2 cells support further studies on possible external signáis acting through intracellular signal transductions by interaction with cell-surface molecules, increasing the activity of some kinases or inhibiting Ser/Thr-phosphatases. We acknowledge to Dr Christopher I. Pogson for his critical reading of the manuscript. This work was supported by Fondecyt grant105-0784.